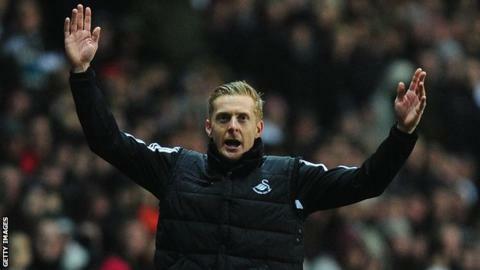 Swansea's new boss Garry Monk says his team will aim to succeed by playing attacking and attractive football. The 35-year-old has signed a three-year deal, describing it as the "proudest moment of his career". He has been in charge on a temporary basis since Michael Laudrup was sacked in February. "That's what will drive me on to produce a successful team that plays attractive and attacking football," said Monk. Chairman Huw Jenkins said the club's board "unanimously agreed that the timing was right for Garry to be offered the job on a permanent basis". Monk, who guided the club to Premier League safety with two games to spare, will be assisted by current coach Josep Clotet. The Swans are currently 13th in the Premier League after losing 1-0 to Southampton at the Liberty Stadium on Saturday, with one match still to come this season. Former defender Monk told the club's website being made manager is, "the opportunity of a lifetime" and he wants to repay the faith shown in him. "I have had a taste of the job for the last three months and it's something I've really enjoyed," said Monk. "I'll be looking to stamp my authority on the squad and the club - and take it forward. I have a plan in my mind and with the help of the chairman and the board how to implement it." Monk joined the Swans as a player in 2004 when they were in League Two under former boss Kenny Jackett. He made 260 appearances for the club, scoring seven goals, before retiring as a player, with the Capital One Cup defeat at Birmingham in September turning out to be his final game. Last season he lifted the Capital One trophy with Ashley Williams after the Swans beat Bradford 5-0 to win their first major piece of silverware. Swansea beat Cardiff 3-0 at home in Monk's first game as head coach and Swansea have won four, drawn four and lost eight in all competitions since Monk took charge 16 games ago. "I have been at this football club for 10 years and I know what Swansea City means to everyone in the community - and beyond," said Monk.